After installing indicator-multiload some days ago, I realized that this small program is very useful for the desktop users in many ways. It provides complete system indicators, not only for networking (real-time up/down speed), but also cpu, mem, and disk transfer real-time statuses. 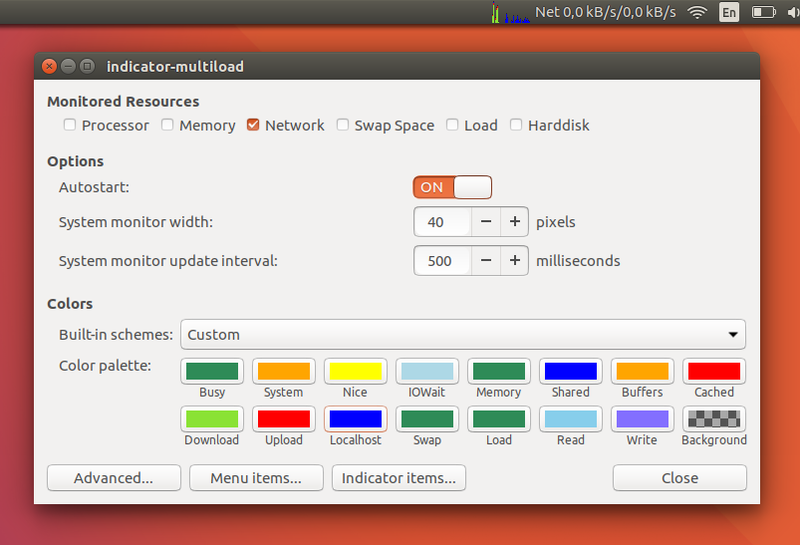 It can be configured to show on the panel only one of them, or combination of some, or even them all. 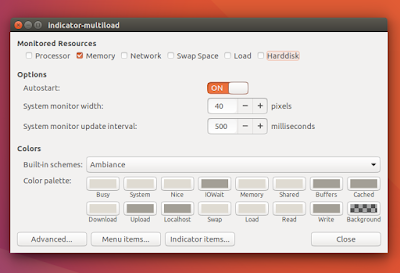 For Unity desktop environment users, indicator-multiload features are arguably needed. So here I show you the examples in configuring indicator-multiload to show the things you need from your system statuses. 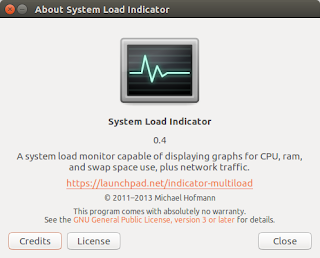 System Load Indicator (package name: indicator-multiload) is a program to show real-time system status in Ubuntu Unity desktop or any GNOME based desktop system, developed by Michael Hofmann. It is free software under GNU GPL v3+ license. Its official webpage is https://launchpad.net/indicator-multiload. I have written the installation and basic configuration here. It is available in all version of Ubuntu releases from the official repositories. 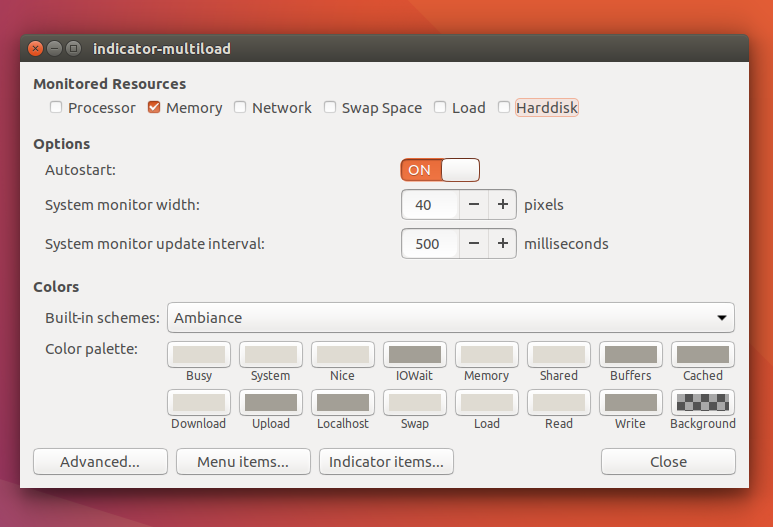 To open the configuration window, first run your indicator-multiload and then click on it > select Preferences. To show a real-time graph and up/down speed of network, check only Network on Monitored Resources and then raise the Net $(...) selection to the top of list on Indicator Items. You can test the indicator by downloading something from the internet, for example. To show a real-time graph and disk transfer speed, check only Harddisk on Monitored Resources and then raise the Disk $(...) selection to the top of list on Indicator Items. You can test the indicator by copying something from/into your disk drive. In picture below, I was copying a huge iso image between SSD partitions. 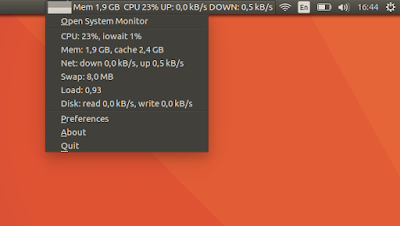 To show a real-time graph and CPU usage status in percentage, check only Processor on Monitored Resources and then raise the CPU $(...) selection to the top of list on Indicator Items. To show a real-time graph and RAM usage status in GB, check only Memory on Monitored Resources and then raise the Mem $(...) selection to the top of list on Indicator Items. Mem $(size(mem.user)) CPU $(percent(cpu.inuse)) UP: $(speed(net.down)) DOWN: $(speed(net.up)). You can change the color of every aspect of the graph. For example, change the upload color to RED and download color to GREEN.